Members in 2018 now have two options to renew their membership for 2019. In response to the normal US Postal mailing that will be delivered in early February. Folks that were not members in 2018 also have two options to join BBLA. Last year, a number of members asked for an option to renew their BBLA membership and pay dues electronically. The Board responded by working with BBLA’s technical consultant-contractor to provide an electronic option. We began by sending 2018 members an email on January 8th (reminder on Jan 17) with a link included in the e-mail to start the process. Many renewed. Feedback was over 95% positive. Click here for all member comments on the process. Several members identified a need for improvements. The Board responded to develop a way to start the process through the BBLA website. A number of members felt the process needed improvement to make it easier or to further address concerns about security of personal data. Clicking on a link in an e-mail to bring a member’s individual record was a concern. UPDATE- Working with our technical consultant-contractor, we rapidly changed to the website based method shown on the renewal documents. Information now goes through the BBLA website after an individual log in. All payment information in PayPal is encrypted as it was previously. Note those who did not renew electronically will receive the normal postal mailing. It is possible a few will renew while the postal mailing is on route. Electronic dues renewal is part of the BBLA Board’s commitment to increasing the options for electronic communications with members. Click here to see the Presidents Report on Behalf of the Board, It includes the meeting agenda, comments on transitions within the BBLA Board, as well as significant activities in the past year in each of BBLA's four major purposes. Members approved the bylaws change and elected the following as BBLA officers: President-Patrick McGuire; Vice President-Kathy Sierra; Treasurer-Susan Fried; Recording Secretary- Mary Louise Embrey; Membership Secretary-Tracy Mulligan. Members received presentations on beach replenishment and on Tidal and Rainwater Flooding. Click here for the presentation from Charlii Miller of ECSI on Tidal and Rainwater Flooding in Bethany Beach. Senator Carper spoke in Bethany Beach on October 26, 2018 about the recently adopted Water Infrastructure Act of 2018. 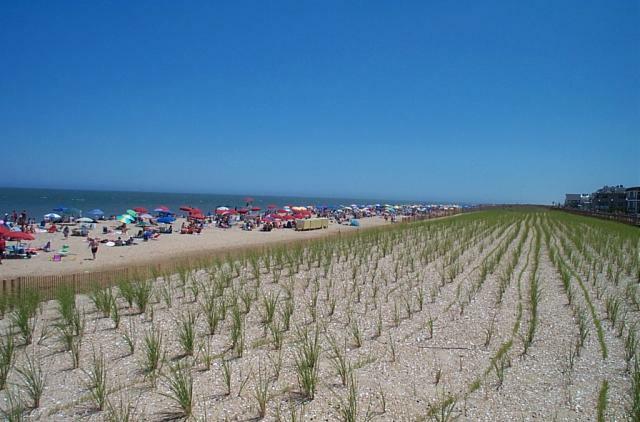 "For our state, this bill ---includes a new $75 million program to address critical beach nourishment projects along our coasts. " On January 18, 2019 the Town Council conducted a well-attended hearing to review engineering plans and hear public comments on the proposed creation of a 5-foot wide walkway, on part of the Town’s public right-of-way property on the south side of Collins Street, from Half Moon Drive to Kent Avenue. Individuals were also allowed to ask the Town engineer questions about the proposed project. The proposal was developed to address serious and growing concerns about pedestrian safety on the street. Without a sidewalk, pedestrians walk in the street, which is one of the most heavily travelled streets for vehicles, pedestrians and bicycles in Town. Available information indicates that the right-of-way property deeded to the Town for Collins Street was 40-feet. The paved street is now a relatively narrow 20-feet wide, with 10 feet of unpaved right-of-way on each side. The Town engineer recommended construction of the proposed walkway on part of that unpaved right-of-way to provide a safe walking area out of the vehicle travel lanes for the many pedestrians who use Collins Street to travel to and from the beach, boardwalk and downtown Bethany Beach. construct the walkway and also install speed bumps and stop signs, as recommended by the Town engineer. The Council is expected to decide on a course of action in the next few months. We will keep members informed of further developments.